Audiophile marketing is filled with euphoric accolades about the virtues of aluminum. It is supposed to have excellent vibration control characteristics, and many say it gives beautiful tone quality to the music. We wanted to check and see why aluminum is held in such high regard, especially when other material like panzerholz is available. Panzerholz is known for its extremely high density (it sinks in water), its high strength (it is used as a metal substitute), and that it is bulletproof. 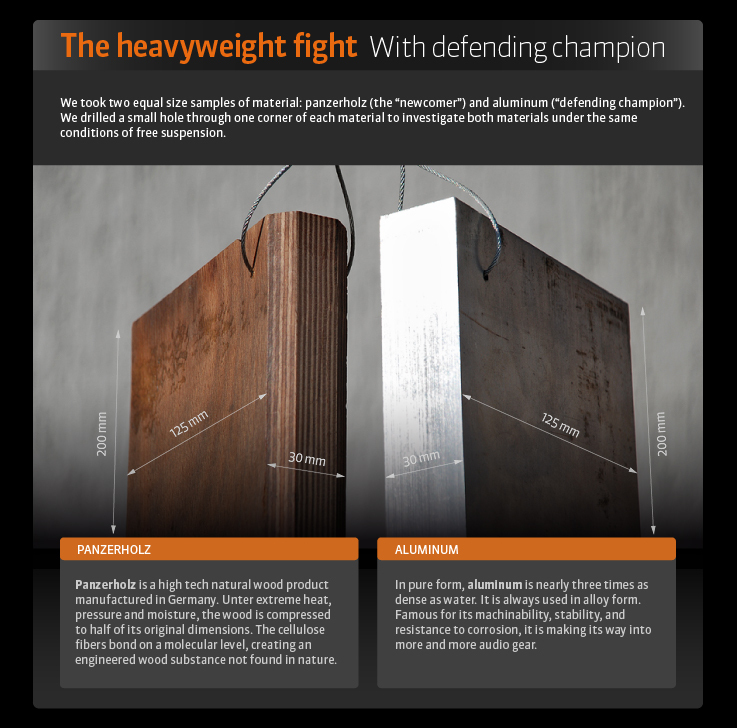 Engineering spec sheets show that panzerholz ranks among the very best regarding its acoustical damping characteristics. With this in mind, we wanted to quantify what seemed mostly opinionated argument. We wanted to see if we could pinpoint what comprises these good acoustical characteristics and whether they could be clearly shown. If you’ve seen aluminum advertised as aircraft grade aluminum, know that these terms have no officially recognized meaning; nor do they refer to any specific alloy. In aviation, if a specific alloy is given, it must adhere to standards regarding qualities of high strength compared to low weight. Aircraft grade aluminum alloy is no specific alloy; nor is it an acoustical performance description. 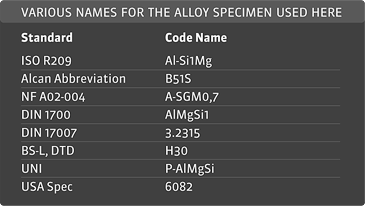 The exact aluminum alloy we used for this test has many names according to the varying terminology used by the standard it is filed under. First, we acquired the data. To excite the samples acoustically, we struck them with a hammer. A strike equates to acoustical energy of all frequencies at once. What we needed for direct comparison purposes were two strikes of equal loudness for each material sample. First hear how each block sounds when struck several times. We positioned and suspended the blocks one after the other into the same place in front of the microphone, measuring distances for accuracy and repeatability. We let each material finish ringing to its naturally silent state, without damping it via contact with any other object other than the wire suspending each block. With the panzerholz sample, notice how when it was repeatedly struck, the hammer contributed a slight metallic sound. The hammer was held tightly to reduce its own metallic sound contribution to the microphone signal. No amount of clenching was completely successful, but as you’ll see, for these tests, it was clearly enough not to interfere with the interpretation of the results. In the Aluminum sample, you can’t hear the metallic sound at all because of the sound made by the aluminum. Of course it is there, just as in the panzerholz example, for it is the same hammer being held in the same way. Its sound was camouflaged by the sound made by the aluminum. This provides us with our first piece of valuable information about the acoustic damping properties of aluminum vs. panzerholz: the aluminum sample doesn’t allow us to hear the hammer’s own resonance contribution, whereas the panzerholz sample does. They’re both identical regarding peak level and time length. This way they’re directly comparable to reveal useful, informative data. We’ve provided the original full-resolution files so you can run your own analysis, using your own equipment, under any aspect you deem important to investigate further. Using these two samples, we ran the first test. What you see here are two waveforms depicting the amplitude of each wave (vertical axis) over time (horizontal axis). The above results were calibrated. This means that the peak level (0 dB, or 100% amplitude) the microphone registered was of identical amplitude in both strikes against aluminum and panzerholz. But please note, this doesn’t necessarily mean the two strikes had the same velocity. 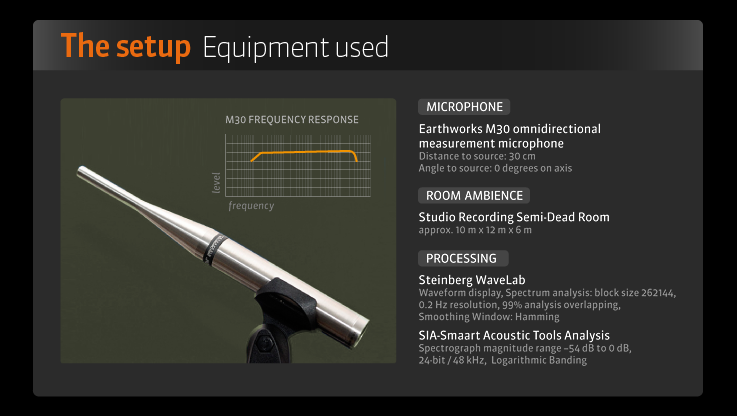 It means only that the first acoustical wavefront’s peak, hitting the microphone’s membrane, moved that membrane the exact same distance in both cases. The hammer was on the far side of the material when viewed from the microphone. So, to be completely clear, all we are comparing here is the intrinsic resonance response of the two materials, regardless of the comparative velocities of the original strikes. Our test, then, is clearly not about the hammer. It is about the intrinsic acoustical damping properties of these two materials, uninhibited by any influence except their own process of absorbing or releasing acoustical energy—a process whose release of acoustical energy began in both instances at the same known calibrated level. 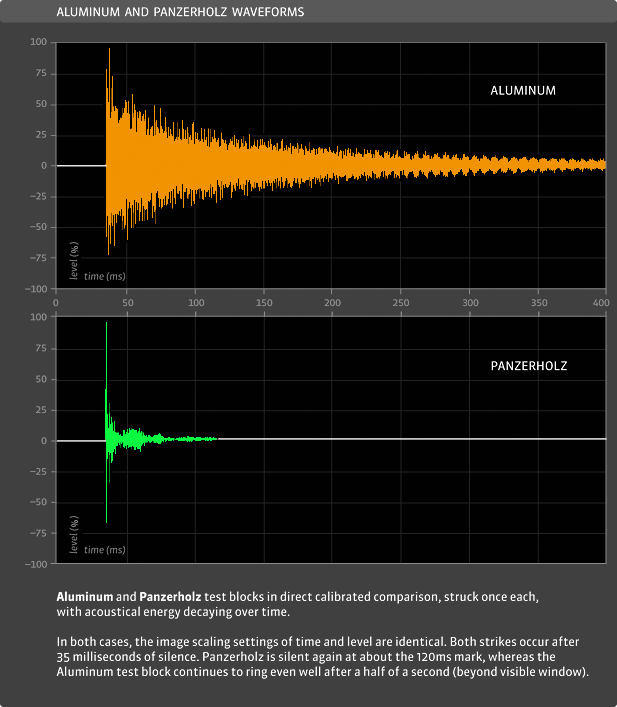 We can see clearly, by comparing the two curves, that the aluminum test block displays pronounced and clearly definable frequency resonance characteristics, whereas the panzerholz block appears to show almost no such resonant behavior. Now, taking our analysis a step further, we combine the acoustical frequency response data for each test material with the time it takes for these frequencies to dissipate. We see how each frequency (on the left) fades out in intensity (color heat gradation) over time (horizontally). Observe how clearly these 2.5 seconds describe the acoustical damping behavior of both materials. Here we see not only how long they ring, but which frequencies ring for how long. 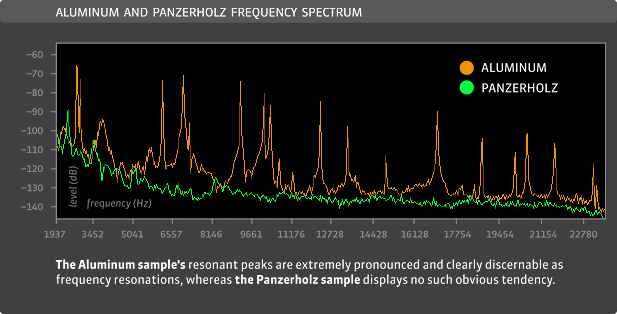 When it comes to acoustical damping properties, panzerholz clearly displays superior spectral homogeneity and resonance suppression—the two things that matter most. From the strike, its immediate dispersal of energy into an amorphous dissipation of acoustic energy, without displaying a definite sonic signature, puts panzerholz miles ahead of aluminum regarding neutral vibration-absorption performance. Aluminum has been shown to portray characteristic "tones" which ring like a bell at certain pronounced frequencies, and does not dissipate acoustic energy in a homogenous manner. We should be careful, therefore, in how aluminum is used in high performance audio products. 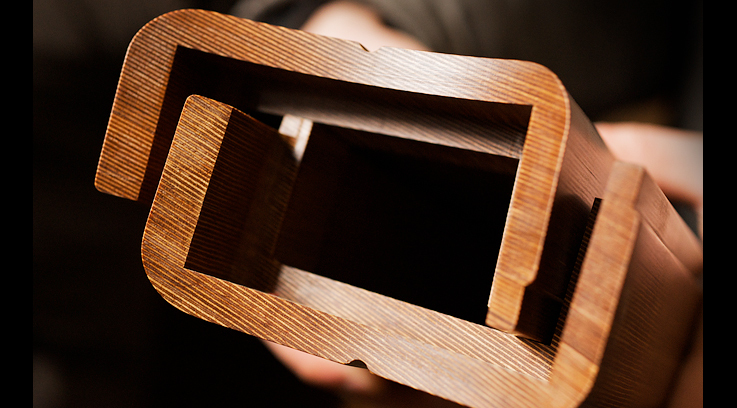 In terms of intrinsic acoustical performance, panzerholz is certainly the better choice.